La Maison Jolie: How To Decorate With Lanterns... Indoors! Lanterns are a great garden accessory but they can also create an inviting and warm ambience indoors. With a rise in minimalist Scandinavian design styles, it's no surprise that many of us are now using lanterns to decorate awkward corners or accentuate design features indoors. It's the perfect way to create some hygge! I have so many lanterns that I could probably start my own shop! After all there are so many beautiful options available that it is easy to get carried away! I love decorating with candles and lanterns. 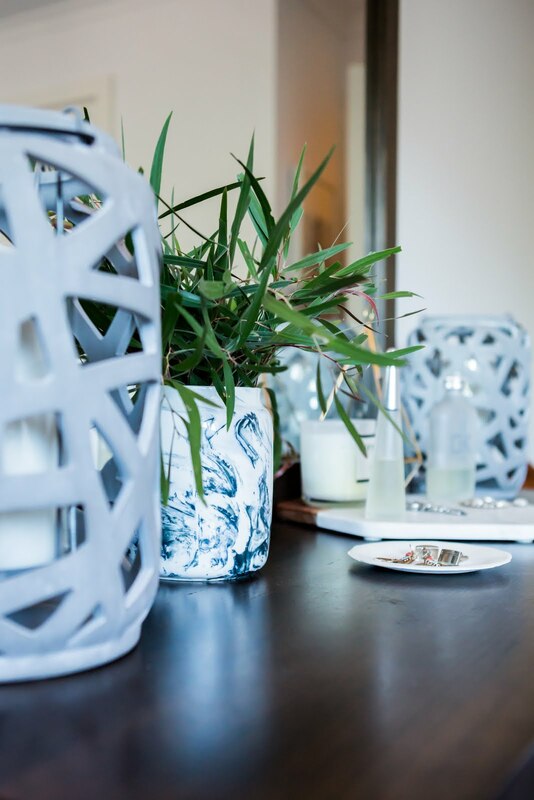 My favourite are the gorgeous Urban Forged Reed Lanterns from Haven in my bedroom and a very contemporary Captain's Lantern in my dining room. Like with any other accessories, when styling with lanterns indoors, there are a few design principles to keep in mind. Here are some of my tried and tested tips. Interior design accessories enhance and add to the aesthetic value of a room and therefore the 'where' i.e. placement of these accessories is of utmost importance. 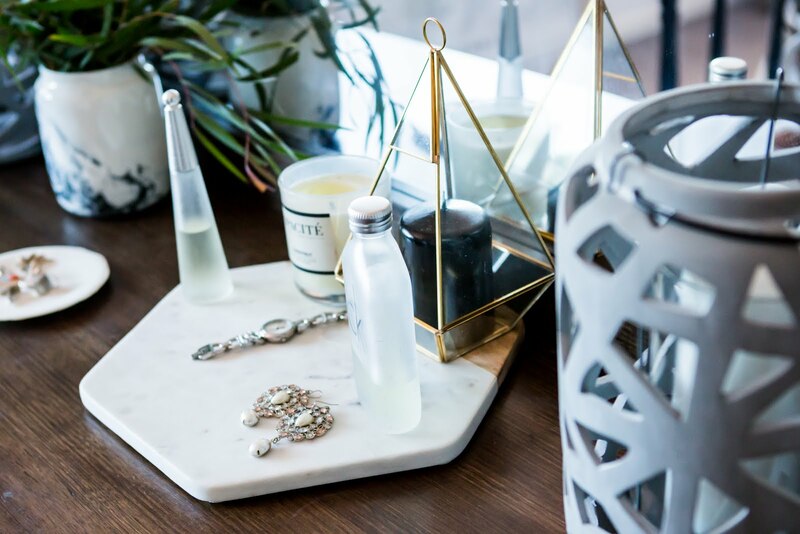 Accessories help in achieving balance and personalise your space. For some, placing accessories slightly off-center is more visually appealing like the 'rule of 3' while for others symmetrical uniformity creates a prettier picture. Though symmetry is not my thing all the time, sometimes it is great for balancing large pieces of furniture like the large vanity/dresser in our bedroom. On my dresser, I have two beautiful Reed lanterns on either end to create symmetry that matches the two antique armchairs on either side of the dresser. Also these lanterns are visually heavy and by having them on the two ends definitely helps balance out the visual weight. One of the easiest ways to add bags of style to your room design is to curate objects into vignettes on top of coffee tables, buffets, sideboards, dressers, vanities and shelves. A vignette is defined as a small, aesthetically pleasing picture formed by grouping several objects of varying heights and types keeping in mind the principles of balance, scale and proportion. Adding lanterns to a grouping or vignette can create tons of visual interest. Candle lanterns come in various shapes and sizes and you can mix and match and layer them to create an eclectic and unique designer worthy look. Pick a couple that suits the style of your room- minimalist, contemporary, modern, country, beachy, ornate etc and group with other objects to create interesting vignettes. In my bedroom, I've created a vignette on top of my dresser with the industrial Reed lanterns from Haven, along with a ceramic canister with beautiful moss green leaves from the garden, a marble and wooden board, a hand poured candle and a candleholder with a touch of brass. The greenery complements the grey cement lanterns beautifully while the white marble board and the glass candleholder lighten the overall effect and the brass adds a touch of bling. One of the cardinal rules in interior design is to add layers of texture. All surfaces have texture. The surface of any object, furniture, textile could be matt, coarse, fine, silky, woven, smooth, rough, shiny, bumpy and wooly. Texture is what transforms a great interior design to an enviable, unforgettable interior space! 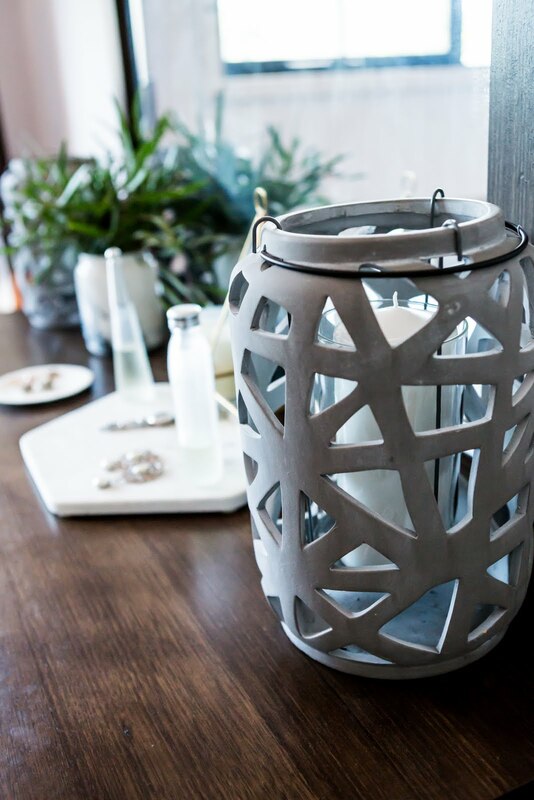 Apart from creating visual interest as a part of a vignette, lanterns are a great way to add texture to a room, especially these gorgeous industrial Reed lanterns from Haven. They are almost akin to a 3D sculpture. The Reed lanterns are made from cement and have a beautiful smooth salted texture that enhances the room design while adding to the ambience. 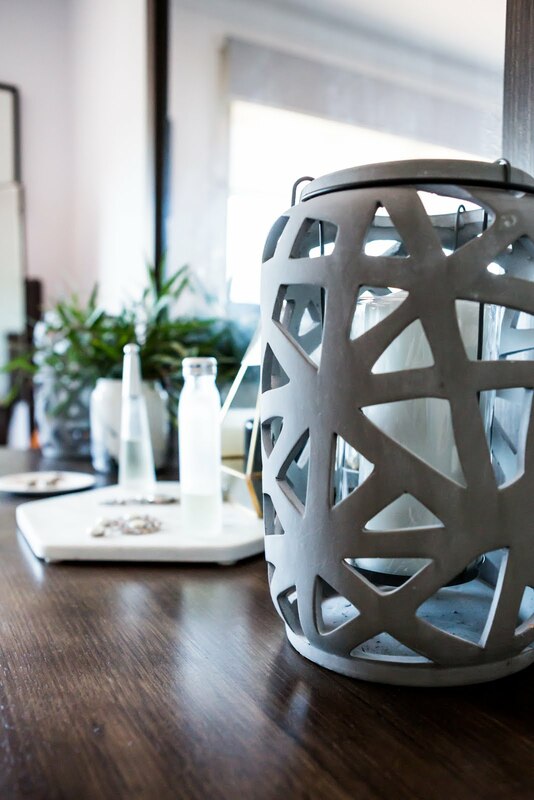 The most important thing to remember when buying lanterns for indoor spaces is to ensure you know what material your lantern is made of - metal, wood, concrete, glass. Keep lit and hot lanterns away from flammable objects and materials indoors and never leave candles burning unattended. From a safety perspective, I really like the Reed lanterns since they have a separate glass tube for the candle, so the surface area of the lantern is always cool to touch. I love how the industrial chic lanterns fit in with the urban Scandi style in my bedroom. 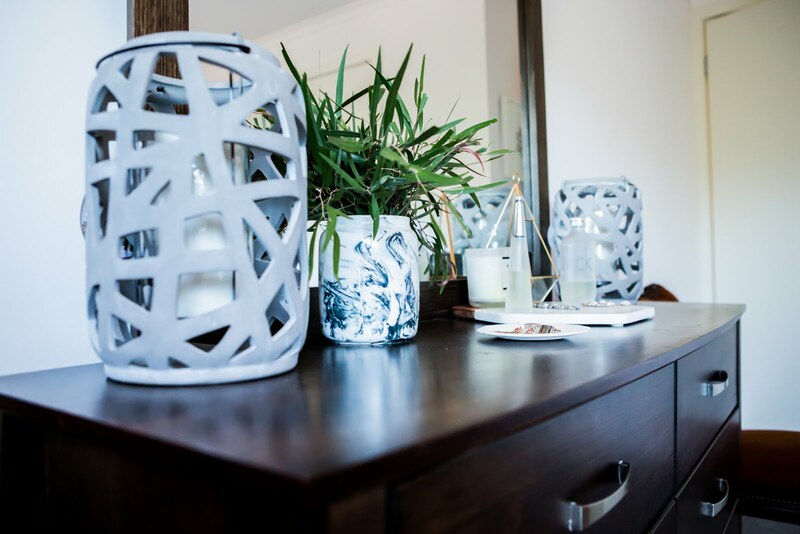 Whether it be drama in the dining room, an inviting atmosphere in the living room or a calm oasis in the bedroom, lanterns are a beautiful way to create a relaxing ambience in your home. These tips are completely transferable and can be used for styling any accessory...so style away! Till next time... create some drama in the bedroom with Haven Lanterns! This post was created in collaboration with Haven Lanterns. A big thank you to Haven for sponsoring the gorgeous industrial Reed lanterns. You can see them all here. As always, all design choices, words, thoughts and opinions are all mine and genuine and I only ever work with brands that I love and I think you will too. Thank you so much for supporting the brands that support this blog.